I am naturally seduced by language that expresses sheer optimism. I can't help it. For this exhibition, however, I had fun playing with language tinged with a bit of uncertainty and tension as well. 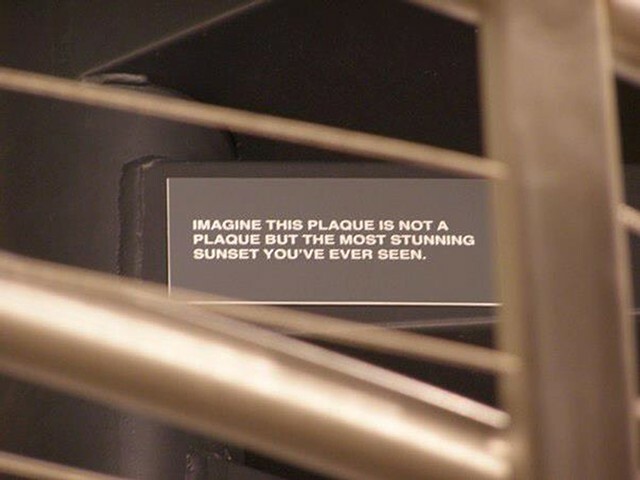 Plaques is a series of simple gray and white engraved text placards that are installed in the gallery and spill out into unexpected spaces in the 5M building. You've probably seen similar plaques in an office building directing you to the lobby area; or on the door of your dentist with her name engraved on it. I love the familiarity and authority of these signs. You really want to believe them. Several of the texts on the plaques reference "found" phrases and concepts I came across on the websites of 5M organizations. This language is bursting with the sense of possibility  whether business, social, physical or artistic. For me, this kind of optimism feels like familiar territory.